Wednesday September 15, 2010 I’m such a sucker for books. And my boys know that. They always knew Mom would say no to a new game or Matchbox car, but she’d never say no to a new book. Memories of stories and characters embed themselves in our hearts and minds and stick with us for a long time. What will be your child’s memories of storytime? I asked my sons to give me their first impression when they heard “book from your childhood,” and the answers were interesting. My oldest said immediately, “Hardy Boys!” He read every one he could get his hands on, working his way through Franklin W. Dixon’s series. The next said, “That Richard Scarry book.” I can see the cover now – it’s Cars and Trucks and Things That Go. They really all loved that book with its silly hot dog car, umbrella car, you name it. It was so creative and fun. Son number three said, “That dragonfly book. The one about the dragonfly that was lonely and found his friends.” I responded, “What dragonfly book?” Then I remembered – it was a firefly. “The one that lit up at the end?” I asked. That was it. The Very Lonely Firefly by Eric Carle. And the youngest said, “That caterpillar book that lit up on the last page.” He was mixing his Eric Carle creations (Carle also wrote The Very Hungry Caterpillar), but he remembered the same firefly book that his brother had. I was surprised at first, but then I realized since they shared a room and bedtime rituals until he was 9, it’s not surprising their favorite book would be the same. I was transported back to lazy summer days and sweet bedtime hours as I heard their answers. 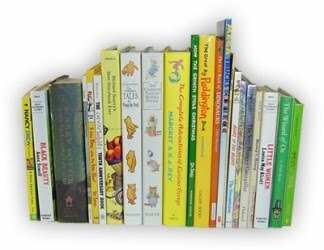 And I thought of my own favorites: Corduroy, Goodnight Moon, The Velveteen Rabbit and Is Your Mama a Llama (by Deborah Guarino). I recalled the excitement and humor of Holes, a book that drew in one of my less eager readers. I loved to see the anticipation on his face as we opened the book together. I remember having the boys choose two poems from the A Child’s Garden of Verses when I thought we were pushed for time. That early exposure to rhyme and rhythm, the lilt of verse, sometimes soothed the savage little beast and introduced them to a few of the finer things in life. Magical moments, all made possible because of books. Have you had those moments? Which books will find a lasting place in your child’s heart? I still can smell my sweet baby girl's head as I rocked her to sleep reading "I love you this much" and "Runaway Bunny" and "Goodnight Moon". That was our ritual after she was one and finally let me rock her before bed. Excuse me while I go curl up with her blankie and rock myself while she's in 2nd grade now! sniff, sniff. I agree about the Velveteen Rabbit. Even years later it's still my favorite kids' book, and still moves me to tears. I can't wait until Sweet'ums is old enough to "get it". I also remember Ducktails by Janette Oke from elementary school--we had the teacher read it a dozen times that school year because we loved it so much. And right now, Sweet'ums' favorite book is called "You Are To Me" by Rebecca Doughty. It's a bit silly but I secretly love it too. All of the Give a Mouse, a Moose, a Pig and whatever books. I read them to my firstborn boy, and now I'm reading them to my secondborn boy. Two books, two songs, and a prayer. That's been our drill for seven years now! They also love any of the Cynthia Rylant books, Jan Brett, Dr Seuss, Bill Martin Jr, Animal Ark series, Chosen Girl series..I could go on and on!! We are definitely a house of readers and I could never say no to buying new, good books!! My kids loved having me read to them...I don't remember the specific book titles, but I do recall reading their favorites over and over and over. You know what I mean? And books still amaze me. Congratulations on that precious grandbaby! He's beautiful. My oldest son and I have shared some of our sweetest moments during story time. Not just because of the stories themselves but how we each connect with them...and each other. Now that he's older, sometimes before his bedtime we'll each settle down with our mutual book selections and share a few minutes of quiet reading time. Love the comments about the Runaway Bunny and Goodnight Moon. I Love You Forever also high on my list. Just wanted to let you know I have been thinkin about you my friend. Exciting times! Let me know when it's good to chat. Praying for you. Oh there are so very many. The Diggingest Dog, when the kids were young. Now Noah loves Harry Potte rand the Magic Treehouse series. And even though Dr. Seuss still drives me a little looney, Rowan loves his stuff. I had forgotten about the Magic Treehouse series -- those were truly magical. I loved them as much as the boys did! Oh, I love books. . .I could go on and on. Good memories for us come from Brown Bear, Brown Bear. Even though it's a board book, my girls still quote it.